Kobo what? I’m sure you’re wondering why I didn’t just buy a Kindle. I’ve tried my best not to support and buy products from Amazon after reading this Mother Jones article about the real price of free shipping. I also like supporting local, independent bookstores, and Kobos are available to purchase at my fave indie LA bookstore, Skylight Books, and Powell’s, the love of my life in Portland, OR. I already have an iPad, but found reading books on the device too much of a strain on the eyes, and it was too bulky to read a book on. (Though I love reading magazines on it via The Next Issue app.) I wanted an ereader that looked more like a book page. I also wanted a good backlight on it so I could read at night without turning on a light. 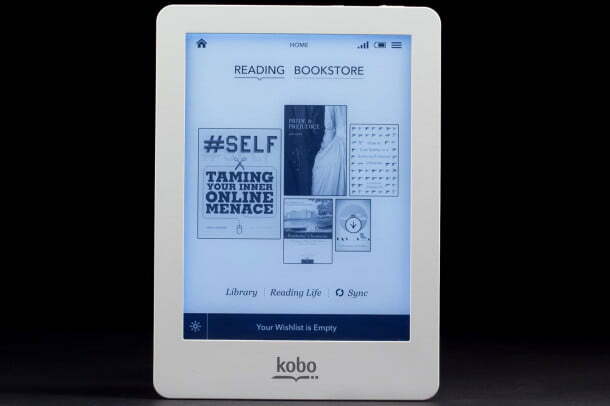 My husband bought me the Kobo Glo for Christmas, and I’ve spent the past few months reading on it. I wanted to share my review of it because the only reviews I’ve read are mainly on tech websites, which are helpful, but I wanted to share my personal experience. It’s very lightweight and portable. The battery lasted for a month. I used WiFi on it occasionally. The backlight is the perfect soft glow. The text is very readable. It carries 1,000 books on it and can expand to 3,000 books if I add a memory card. It’s sold at independent bookstores. I received good customer service through @KoboHelp on Twitter. I can create a wishlist of books on my device, but on the website, it only allows you to add books to a shopping cart. When I contacted customer service, they said they are working on that problem. The biggest downside to me is that they offer gift cards, but no one in the US can purchase them. I had asked for gift cards for the device, but unless my friends and family live in Canada, we can’t purchase them. When I asked the customer service about this, they said gift cards can only be purchased in Canada, but could be redeemed in the US. I wish this wasn’t the case! Using the internet on the device is slow. I typically look up words in the dictionary, but once looked up a person referenced in the book I was reading. The web page was hard to navigate. Overall, I really love reading on the Kobo Glo. Yes, the Kindle is cheaper and ebook purchases are cheaper, but I wanted a device that wasn’t from Amazon.